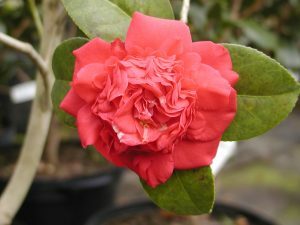 A wonderful selection of evergreen Camellias grow and flourish in our area and should be grown more in our landscapes. 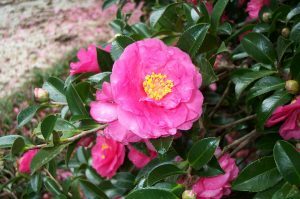 The fall blooming Camellias are a group which includes several species including the fairly well known Camellia sasanqua but also hybrids, the tea plant, species used for oil production and rare species seen only in a few gardens or the wild. In general these are large shrubs which are well adapted to our climate and are tolerant of a variety of conditions in the garden. I find the earlier blooming types are the most rewarding since they start blooming in early October and continue blooming until we have hard freezes in November or December. Sasanquas provide floral color in autumn, which is rare on evergreen shrubs and a large plant will bloom over a long period and even carpet the ground with petals. They produce many flower buds, which open at different times so an extended bloom of 6 or more weeks is common. In Japan the wild C. sasanqua has a small white flower but through breeding and selection, larger flowers and brighter colors have been introduced into cultivation. The range of flower colors includes whites, apple blossom (white with pink edges), light pinks, deep pinks and a few reds. Flower forms include single flowers with 5-7 petals and a cluster of yellow stamens in the center, semi-double flowers have ten or more petals and a cluster of stamens, peony form flowers are 3 dimensional with a few stamens mixed with ruffled petals and formal double flowers are many layers of petals without any stamens. 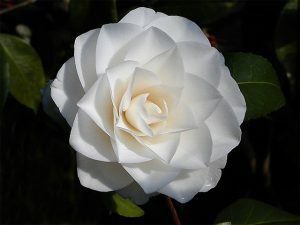 One of my favorite sasanquas is ‘Autumn Moon’ which has white formal double flowers and a tall narrow plant form. A few varieties grow more slowly and tend to have a spreading growth habit, which makes them more useful where space is limited. ‘Shishigashira’ grows about 4-5 feet tall and slightly wider in a dozen years with bright pink flowers and glossy leaves. In deeper shades ‘Irihi-no-umi’ has intense reddish pink flowers, which sometimes take on a bluish hue. Many varieties exist in different flower forms, colors and bloom times and a variety of plants forms is also available including weeping and even contorted habits. Interspecific hybrids mostly involving C. sasanqua are also quite useful in the garden and they expand the palette of colors and bloom types. The hybrids are grown like sasanquas but can be quite striking such as ‘Moon Festival’, which has light pink flowers up to six inches across. Hybrids bring in a wider range of colors including a true red in ‘Mieko Tanaka’ which has a very extended bloom season from October into January or February although freezes will damage open flowers during the later part of the season. Although not necessary for our area there are many hybrids involving the orange barked C. oleifera, which gives the progeny a lot of cold hardiness. Some of the hardy ones such as ‘Autumn Spirit’ and ‘Survivor’ can be grown successfully as far north as Long Island. One fall blooming species is C. sinensis, the tea plant. This has relatively small white flowers but this is the plant that is used to make the tea we drink. Tea is often grown in warmer areas but many varieties grow well in our area and in fact it has been planted in the Coker Arboretum in Chapel Hill for over 50 years. This handsome evergreen shrub can be used as edible landscaping in place of hollies and can be kept quite small by harvesting or pruning the plant. Two of the best varieties are small leaf tea, which will grow to 6 or 8 feet tall and large leaf tea, which will grow to over 15 feet tall. Some of the rare species we can grow include C. octapetala with leaves up to 8 inches long and apple-sized seed capsules, C. oleifera grown for seed oil production in China, and C. yuhsienensis with fragrant white flowers in profusion. All of these species and varieties are easy to grow as long as well-drained soil is provided. These will grow in clay soil but the soil cannot stay soggy. I like to amend clay soil with a 4-inch layer of compost, which I till into the existing soil with a rototiller. A 4 feet wide bed works well. These Camellias are quite tolerant of various light exposures but I have found about half a day of sun results in heavy bloom and good looking foliage. If these are in too much shade they become tall and sparsely branches with minimal bloom. Too much sun especially in the winter results in lighter colored foliage and possibly some winter burn but a profusion of flowers. Pruning can be done after they bloom (winter). The flower buds develop in May or June so summer pruning may reduce the number of flowers. A light fertilization in the spring is helpful but old shrubs grow and bloom without any care for hundreds of years. Scale can be a problem on stressed plants and can be controlled with a horticultural oil spray on the undersides of all the leaves. In spring some varieties can get an infection of exobasidium, which causes the leaves on new growth to swell up and turn whitish. Usually exobasidium is a minor problem that can be reduced by picking off the infected parts and disposing of them. 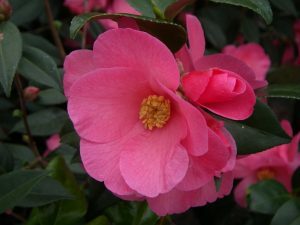 When you see large evergreen shrubs with pink or white flowers in October they probably are fall blooming Camellias. There is a wide variety to chose from in white, pink or red flowers; single or double flower forms; tall, short, weeping or contorted plant forms and small to large leaves. Search out something you like and find a home for these striking shrubs.